You can follow along with the map here. 01|18: Swamp of Painted Skin. Diseased swamp. Bog mummies enact the ritual tripartite death (throat cut, skull bashed in, drowned) on whoever they encounter around their shrine—thus creating more bog mummies. Beneath their ritual site is a +2 braining club and a torc of kingly tides. 01|19: Coastal. Stony island with three lighthouse beacons. Intended to warn ships in winter, their real purpose is to keep the Claw of the West in Hex 04|15 from awakening; if extinguished, mi-go will attack and decerebrate people to store them in brain canisters. 02|16: Coastal/Muro Forest. Drabs (talkative crow-parrot crossbreeds) have learned several mind control spells (cause fear, charm person, etc.) from an enchanted mural that recites spells as a teaching aid. Braving the drabs (who can compel people to drown themselves or leap off cliffs) leads to a lecture hall that contains a spellbook with most 1st to 4th-level enchantment spells, a book of panoplies, and a wand of Drusian’s enrapturement (35 charges left). 02|18: Swamp of Painted Skin. CASTLE INDIGO. Old fortress of Simani’s warlord Calrath (wight barbarian). Contains countless undead dangers as well as great treasures, including Calrath’s scimitar, a fan of many fingers, and a coronet of deballation. 02|19: Swamp of Painted Skin. Enormous mangrove trees and waterfalls hide degenerate remnants of drow elf servants of Calrath (Simani’s warlord) and their bloody ink-rites. Their Tattoo Engine is in poor repair. 03|16. Coastal/Muro Forest. Stone heads look out on a misty, treacherous shore ill-suited to landing. The heads are intricately balanced by Old Realm engineering. Within, former pet dogs have gained intelligence and now communicate through howls with the werewolves in Hex 3|18. 03|17. Muro Forest. A magical gate, long abandoned. Sometimes aberrations flap through it. Hidden from almost every angle except from the observatory in Hex 03|18 are golden treasures pulled from some alien realm, including a portable fane, a +1 sword of the wind that blows between the stars, and a figurine of wondrous power (obtunding marmot). 03|18. Muro Forest. THE STARWATCHER’S GARDEN. Observatory of the long-slain necromancer Patabesh, now given over to a pack of cruel werewolves created by the feral vampire heart now in Hex 13|14. Their leader, Angranicor of the Emeralds, tries to convince the intelligent dogs of Hex 3|16 to serve him. From the top of the “garden,” anyone with a looking glass can see a golden treasure far below in Hex 3|17. The Great Rift of Hex 4|17 is also visible. 03|19. Muro Forest. The Lance River flows south-to-north. On the east bank, a massive fungal growth, Mother Mushroom, now guarded by water elemental centurions from Hex 03|20, chokes the landscape and calls out for slaves to feed it. 03|20. Coastal/Muro Forest. TOWER OF THE HYDROMANCER. Perpetually rainy. Not really a tower—actually a converted submarine. Here Tromorios the Hydromancer (middle-aged male gnome water-mage 8, ng) studies magic with the help of a dozen charmed human and ogre pirates. Mother Mushroom from Hex 03|19 recently carried off several of his water elementals. One of the pirates, Scalwash (adult human female rogue 5, ne) is no longer charmed and is contact with the LYCEUM (Hex 14|18), who want Tromorios back for stealing a twelve demon tankard. 03|21. Coastal/Muro Forest. GHENRI. Keimian Village of 800 ruled by Daxxer (middle-aged human male aristocrat 2, ln). People believe a well spirit protects their village from undead and pirates. In truth it’s Corrosion (young black dragon) who hides in the well and prepares for her emergence. She has secretly been tainting the blood of young people, turning them into sorcerer-knights loyal to her. 03|22. Coastal/Muro Forest. In a raised, walled garden, the druid Senya (half-elf adult female druid 8, ng) studies the necrotic corruption beneath her to learn how to combat it elsewhere in Muro Forest. She occasionally needs people to descend into the dark, haunted woods to procure samples. 04|14. Coastal/Muro Forest. A martially-submerged Old Realm temple to Sidian, God of Chariots (now deceased). Unusually susceptible to the moon and tides, haunted by drowned zombies and sacred to the werewolves in Hex 03|18. The vampiress in Hex 08|23 once kept her heart within, but it grew ambitious and escaped. 04|15. Coastal/Muro Forest. Beneath the waves here, a mutant mer-creature called Veshara the Seeper works to awaken an ancient, slumbering power called the Claw of the West. She needs three things to awaken the beast: 1) to extinguish the watchtowers in Hex 01|19, 2) to find and execute the “perfect sacrifice” in the cliffs of Hex 14|16, and 3) to banish the watchers in Hex 21|06. 04|16. Coastal/Muro Forest. The Stag of the Starry Heavens (magical beast, cn) dwells here. Occasionally appearing like a man with a stag’s head and occasionally as a stag made of stars, he came through the gate in Hex 03|17 ages ago and longs to return. He can teach a skilled (level 5+) bard, sorcerer, or wizard the methodology of returning and effect his escape, but doing so will open the gate for over an hour, letting unwelcome things through. He will offer fine clothes and private planets to anyone who helps him. Most local wizards know about him and teach their apprentices to avoid his honeyed words. 04|17. Muro Forest. Great Rift. A steep rift with a nest of harpies. (They are as rude as custom dictates, but also knowledgeable of astrology.) Ritualists know that they can summon the colossal ghost of Ahn Roch, the first cleric to bind the gray god Coth, by calling to the birds from a special peak here. The Stag of the Starry Heavens in Hex 4|16 knows the rite, and it can also be found coded on the ceiling of the Capitol Building in Lahaz (Hex 15|15). 04|18. Muro Forest. The Lance River flows south-to-north here. It is nearly impassable except for a Sword Bridge that can only be crossed by the pure of heart (good-aligned). Neutrals fall into the water, evil characters are sliced in half and become (two) perytons. Each side of the bridge has a castle guarded by two elderly fallen paladins, brother and sister, who knew Muro Casmide, betrayed him, and now shoot arrows at one-another because they cannot pass the bridge. One has the stone hand of the statue in Hex 06|20. 04|19. Muro Forest. The dragon Memory of Rain (male adult copper dragon) dwells here and will offer rides in a gilded cage to anywhere on the island for a fee of 1,000 gold pieces. Slow Apes (permanently affected by Memory of Rain’s slow gas) dressed in velvet jackets and short pants attend to the dragon’s needs, but will explode into action (hasted) if the dragon or his treasure is threatened. His treasure includes thirteen elemental-themed swords, which Memory of Rain explains are intended for a company of future heroes who will arise 55 years from now. 04|20. Muro Forest. Painted zombies rest here inside a flower-covered barrow. Painted zombies were Silani’s favorite servants. They are much like regular zombies but with SR 15. If their Spell Resistance works, they absorb any spell of up to 3rd level cast on them (in addition to benefiting normally from spell resistance) and unleash it the next time they hit with an attack. They have a 10% chance of having a spell already. Their barrow contains a +2 suit of unfurling chainmail and a haversack of recollections. 04|21. Coastal/Muro Forest. Hidden pirate cove surrounded by fruit trees planted by Lord Muro after his defeat of Silani. 32 assorted cutthroats led by Captain Chotwaithe (middle-aged male human rogue 3/sorcerer 3, ce) aboard the Storm Villain 2. (The first ran aground after stealing a cargo of enchanted pigs from Hex 19|17.) The captain knows about the horn in Hex 05|22 and has plans to seize it. He fights with a +1 bident of sonic elemental command and favors storm magic. 04|22. Coastal/Muro Forest. Seal rookery. Hundreds of seals descend on the beach during summer and winter (different species at each time). Those that remain during the off-season are often selkies. Because selkies once rescued Muro Casmide, the beach is sacred. Hunting is not allowed, and several Keimian rangers watch the water. The selkies have recently lost a newly-turned half-breed, currently stranded in Hex 10|17. An amulet carried by one of the rangers can help stabilize her form until she reaches the ocean. 05|14. DROOM. Fishing village, population 150. For almost a century, the village has flung unwanted children off the cliffs. They are gathered up by an immortal prophetess who uses their minds to extend her computational power, allowing her to predict the future. Wizards and hierophants journey here to speak to her. Characters will have to wait in line behind 1d6-1 extraordinaries to see the prophetess. 05|15. Coastal/Muro Forest. Long-abandoned city-temple to Heptinion, Old Realm God of Good Counsel (now dead). Sea elves have taken up residence and if treated well, will describe the coastline and its hazards. Aqueduct remnants lead to Hex 05|16. 05|16. Forest. LAKE SCATHO and surrounding villages. Created ages ago by the Old Realm by flooding an existing town to serve as a reservoir for the temple in Hex 05|15 (Aqueduct remnants lead there.) The temple gong occasionally reflects golden in the sunlight. It contains the ghosts of those who died, but with the gong’s hammer (found in Hex 07|14), the gong can project the wrathful ghosts at enemies. A road leads southwest to the mountains and aqueduct remnants lead to Hex 05|15. 05|17. Forest. A wise lynx has learned the trick of anchoring itself in the soil to feed from the nutrients there. This has infuriated a nearby treant, who has begun to devour the sheep of a nearby village. “Redclaws” is sneaky and has become a local legend. 05|18. Hills. A druid, Hothalikki (adult male human druid 6, n), leads a behemoth with trees growing out of its back, seeking a place to plant. He and his behemoth have come from across the sea, but does not know that he came because of the mad treant in Hex 05|17. 05|19. Hills. The Lance River flows south-to-north here. On its banks, hidden by stones and shadows, rises the petrified remnants of Silani’s mount, the Behemoth Worm. Currently occupied by Chole Dax, a wizard thrown out of the Arcane Lyceum for dueling. Chole Dax’s more significant treasures include a rod of nine moons and a placard of the arendator. 05|20. Muro Forest. NEEDLE TOWER RUINS. All that remains of Simani’s fortress: needle-like spines blackened by dragon fire and scoured by armies of knights. A garrison of 100 Keimian soldiers and 12 knights led by Madame Gathry Numenai (middle-aged human female fighter 6, lg) stands watch over the ruins. They have lost several scouts to Chole Dax in Hex 05|19 but can spare no more time investigating. 05|21. Muro Forest. A wide black road here leads to and from the Needle Tower Ruins. Occasionally a knight can be spared to watch the road, but often youths and maidens riding black mares can be seen running errands to and from various parts of the Lower Planes, black hair streaming behind them. They may stop to make sport of mortals. 05|22. Coastal/Muro Forest. Lichen-encrusted skeletons guard a horn that, if blown, will call a dozen of the black riders who frequent Hex 05|21 to service. 06|13. A treant sits meditating as he has for 30 years, hemmed in by skeletal archers with enchanted, everburning arrows. A wight with minor druidic powers prevents the treant from magically calling for help. 06|14. Fen of the Harbinger. A giant-sized ruin contains a floating sphere where two serpent-women are imprisoned. They have not tasted freedom for ages and need only the Lesser Golden Globe (in the Inn of the Screaming Hog, Hex 06|16) to escape. They can exercise power over worms and albinos, even from their prison. 06|15. Muro Forest. An illusion of the Old Realm, complete with towers and temples, that has beguiled several scholars, trapping them amidst its grandeur. 06|16. Muro Forest. THE INN OF THE SCREAMING HOG. Devils meet each other here at the crossroads once every few months. An ignored bard sings of the Tomb of Muro and the Three Statues. The inn's owner sleeps with his head on a golden globe, believing it whispers the secrets of financial success in his ears--it is the globe of the serpent-women in Hex 06|14. 06|17. Hills. The Old Realm Road runs east-west. Just off the road is the underground fortress-tomb of the Corpse Tiger General, one of Simani’s warmasters. A handful of Remnant villagers make pilgrimages to worship and sacrifice to him. The door remains magically locked unless the password is spoken—the password is on the hermit in Hex 19|17. Significant treasures include an eternal tea sachet, gloves of the vastator, and the General’s own +1 flesh-scorn shield. 06|18. Mountains. TOWN OF GRAWNICCA. Population of 950 dwarves. Their leader, Sindwar Pomiri (old male dwarf rogue 4, n), favors gaining help from the ancestors in case the Necrotic Empire should return. His castellan, Sindwar Nazor (old male dwarf aristocrat 2/necromancer 4, ne), has secretly made contact with the Corpse Tiger General in Hex 06|17 and plans to surrender the dwarf cities to him. 06|19. Hills. LAST WALL INN. The proprietor, Udolphus (middle-aged male halfling ranger 4, n) spies for the Olonto. He currently seeks several enchanted pigs native to Sathini, which wander the Muro Forest (a wandering encounter). The Nebulous River begins here. Originally I'd planned to start with an outline of Yane's population and more about the island's geography but then I realized that was super-boring, so here are some useful plot-hooks scattered around the landscape. I probably have about four more pages of these. The italicized location indicators ("hills," "Muro Forest," etc.) are for wandering encounter tables that I have not yet written up. The magical items are, for the most part, fanciful and non-canonical. Countless malevolent forces circle Yane, but here are five of the more common Forsaken Gods--those evil powers who, while part of the world, work to subvert it. Once an obsessed mortal, then a lich, Acamar transcended life and undeath to become an infernal corpse-god with power over magic. Acamar weds a lich's obsession with knowledge to the infernal hierarchy's disciplined cruelty. Despite his arrogance and cruelty, he offers his knowledge generously. Often, the price is only the willingness to work the magic he offers. The goddess of the freezing water beneath the ice, Engsuma is a harvester of souls. She loves hunger, cannibalism, and freezing, and favors ghouls (especially lacedons), ice zombies, and draugrs. Pirates honor her by freezing their enemies to death in salt water. An aspect of the Flayed Goddess of the Middle Gods, Florette focuses on the mortification of the flesh not for its own sake, but for enlightenment and power. Simani’s obsession with Florette (and her increased focus on metaphysics and conteplation) may have spelled the lich-queen's downfall. Florette encourages cults of mutilation and deprivation, especially among women and children, and surrounds herself with a coterie of mummy lords called the Thousand-Handed. A god of robbers of all kinds, Joomrei Thahn is one of the great powers of the Middle gods, and has gained traction in Yane despite his lack of a strong undead focus. Elsewhere he is a god of greed and desperation, but on the Scarred Island, he emphasizes his power over the slow, consuming hunger of specters, shadows, and other ethereal undead. He also enjoys the worship of thieves, brigands, and merchants, the last of whom rely on Joomrei Thahn's banking network to maintain their supply lines with the mainland. When the Hierarchy fell, two true gods survived: the supreme Unconquered Sun, and his twisted, insane child, Latello. The chaos god's secret cult of poisoners, insane aristocrats, and revolutionaries spreads terror in the Remnant, but in Yane they seem more focused. Some whisper that Latello is not as insane as he appears, and has designs on one of the Ten Thrones of the Hierarchy, perhaps the Sun Throne itself. Demons serve him, and he has a particular fondness for vampires and death knights. The truth is that it's hard to write a boring bunch of demon gods. I've found it best to create evil gods the way Robert Rodriguez (apparently) makes movies: I start with a big list of cool things. What do I want the adventurers to fight? Degenerate aristocrats, frozen cannibals, malevolent foreign banking interests, painted mummies, liches...okay, that's five, let's stop there. I usually divide "bad guys" into two categories based on whether or not they could tempt a reasonable person. A mix of intriguing but evil powers and straight-up monsters works best. In Yane, Acamar offers knowledge and power without (immediate) obligation, Joomrei Thahn engineers situations where people must serve him and his network, and Florette, though unsavory, represents the sort of enlightenment and liberation that adventurers might not want, but can nonetheless understand. Engsuma and Latello, by contrast, are alien monsters. Like with Yane's pantheon, I wanted a sense that these are the gods that just happened to wash up on the Scarred Island. They have little in common with one-another and they form no unified "society of evil gods"; other than Engsuma, they've had to twist their portfolios considerably to accommodate this new environment. On Earth, the gods we create bend to economic, political, and social forces; it will be interesting to see how "real" gods react to similar pressures. Before I get on with the evil gods I want to talk about how gods are handled in most fantasy campaigns. Gods are often too distant to be interesting. Even in high-power campaigns they're kept in a walled garden of unapproachability, as if the only alternative is the party killing them one at a time like twelve-year-olds tearing through Deities & Demigods. Gods that meddle--gods as characters--have more to offer. In The Elder Scrolls: Oblivion, you can take jobs (corrupt, dangerous, and highly thematic jobs) from the Daedric Princes, the game's demon lords. The gods, by contrast, gave you stat bonuses when you pushed the "use" button at their shrines. Consequently I remember half the Princes and their dominions but the only god I can name is Talos, and him mostly because of Skyrim and Jason and the Argonauts. Almost no D&D god is memorable, except for a few antagonistic powers (Lolth, Tiamat, Asmodeus). They're all evil, but what makes them interesting is not their evil, as such, but that they're all physical creatures. They're all characters, not power-dispensers. Among Yane's pantheon, I like Coth because, as a sort of chained power, he has plot potential built in. Coth wants something, and not just the way gods want to "preserve the balance" or "fight evil." He's a prisoner; his motivations are immediately comprehensible. And as I review Yane's pantheon, the desire to invest the gods with physicality and motivation grows. Tirwein, the elf godling, is easy: he can physically occupy the Forest of White Owls. But (apart from Fanatin, the warding-god of the dwarves, who is uniquely unapproachable) I suddenly want to see all my gods manifested physically, as characters, in the setting: the Lacarni guarding the sea-breezes, Elicca walking from inn to inn, the Iconess physically instantiated in Keimia, and so on. Each of these gods possesses a powerful--and often hidden--shrine on Yane that serves as a conduit for their power; while outside Yane their full manifestations have different motivations and goals, their aspects on the Island of Scars form a rough pantheon. There, they cooperate to oppose upstart gods and the malicious powers that plague Arkat Bay. A powerful and important goddess among the Middle Gods, Amiza found little traction in Yane until she fused with the Lacarni, eight local wind spirits. With their influence, she has become a goddess of sailors. Centuries ago, Coth was a crude barbarian totem, joyless and chill, disinterested in his followers. But a priest yoked him and, through ritual agonies, twisted him into the shape of a gray patriarch suitable for mass worship. His people died away but his cult proliferated, becoming a major religion that now dominates much of the North. The Church of Coth is rigid, hierarchical, dogmatic, and stoic, but Coth’s true nature gives his powerful servants an independent streak that its (mostly nonmagical) hierarchy despises. A goddess of campfires, love, and mating of animals and people. Her priests and priestesses tend roadside inns and raise great fires to mark their locations in the cold and the dark. Once they demanded flesh or oaths of obedience as the price of spending the night; now they accept money and have become a powerful banking institution. Many coins in Yane are stamped with Elicca's sign--a red elk with a burning crown. A minor aspect of the Allfather of the Dwarves (one of the great powers of the White Gods), Fanatin gained importance to the dwarves of the Temno Mountains when they hid for centuries from the undead. He is now their primary god. The followers of this distant and unapproachable god have been known to go mad trying to decipher his will; heretics whisper that he is no god at all, merely a bundle of magical power, and that explains his silence. A mortal who rose out of the chaos of the north to help forge the Holy Kingdom of Keimia, the woman now called the Iconess represents an impossible mystic ideal toward which knights and scholars can both strive. She is attended by twelve radiant spirits (angels) who interact frequently with the other White Gods, trying to secure a place for the rather earnest people of Keimia in the harsh north. She also has connections to the Great Bear, a significant Keimian druidic spirit, and is sometimes pictured riding him. The Perfect Realm began its long decline when its gods died, though no one knows how it happened. Only the Unconquered Sun survived, and it scrambled to fill vacated posts among the Ten Perfect Thrones of the Hierarchy. To replace the overthrown god of war, the Unconquered Sun found Kuraltes, a minor god of fences. Suddenly promoted, Kuraltes struggles with his new role in the pantheon of what everyone now calls the Old Realm. He has gained some respect as a war god for the hard-pressed people of the Scarred Island, for whom the Iconess can seem too soft and Coth too joyless. Kuraltes is also a god of vegetation and a patron of woodworkers, who celebrate him by creating and ritually destroying vine-shrouded wooden rams or other animals that represent the god. The elemental godling Tirwein experiences alternating bouts of sleep and wakefulness, rising whenever he is needed to heal a land inhabited by elves or fey. He is currently active in the White Owl Forest and Muro Forest, working to restore the land after the long blight of Simani. He lacks foresight, though, and has no plans in case the Necrotic Empire returns. The Middle Gods have a proper god of “thieves,” but Xarrion represents something a touch more aristocratic and elegant: she is the goddess of lies and tricks, moonlight robbery, swindles and revolutions. As a goddess of “words that have power,” she is also Yane’s nearest thing to a goddess of magic. The Arcane Lyceum has little interest now in the Hierarchy’s magic god (Temulo, formerly god of knots), though Xarrion has focused Yane’s spellcasters away from written magic and toward the spoken word and the creation of items…and especially the breeding of monsters, which she loves. Her celebrants dress like horses and flagellate themselves to drive off evil spirits. I worked hard to keep the gods to a manageable number while still offering deities for most roles. Most of the gods are more or less my own invention; the term "The Iconess" derives from someone else's campaign (I cannot remember where on the Internet I first heard it), but the goddess behind the name differs from its original conception. I look forward to seeing Coth--the god himself, and his priests--in my game. I love the idea of a Crom-like god of granite winds and cold peaks beaten into the shape of a palatable Patriarch. Not enough D&D religions feature serious conflicts between the gods and their followers. Next Up: The Malignant Powers! Yane and its sister island, Sathini, occupy Arkat Bay, a coldwater bay surrounded on three sides by the continent of Tandelume and crossable to the north for about three months of the year (four, if you're willing to risk being trapped in the ice). Roughly 100 miles across, the larger and more inhabited island, Yane, has a cool, rainy climate that has given rise to thick deciduous-coniferous woodland. Sathini, protected from the ice wind by its larger neighbor, sees a mix of scrubby pine forests, rolling hills, and rocky beaches. For centuries, the dead ruled Yane from the necrotic empire of Ahn Resh to the east. Humans served as cattle or experimental subjects, herded into lightless gray cities for the convenience of their corpse-monarchs. This nightmare persisted until an invasion from the Holy Kingdom of Keimia, to the west, shattered the complacency of Ahn Resh and drove its undead lords from the island. 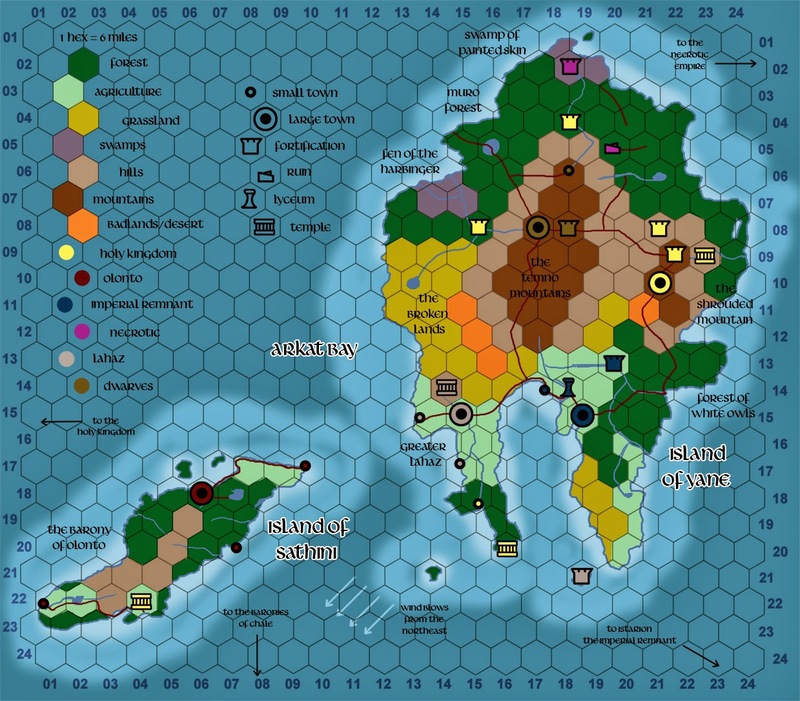 In the time since the liberation, Keimian garrisons have fallen into corruption, greedy pirate-barons from the south have established near-lawless city-states on the island of Sathini, the elves and dwarves have left their hiding-places, and always, the dead wait with their customary patience for a time when they can return to claim what was once theirs. For my return to running Dungeons & Dragons, I wanted a manageable area for exploration. Rather than starting at some insane resolution (whole continents or whole planets), I sketched out a rough landmass and picked an interesting location for a starting island. Yane, with its history of conquest and war, is a bite-sized chunk of adventure covered in necropoli and ruins, with several factions that could break into open warfare. Yane's small size (not much bigger than Jamaica) means that eventually a party will outgrow it, but I'm hoping to get at least a half-dozen levels out of the place. 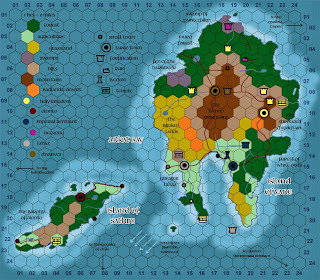 There is currently a non-zero chance I'll get to game in the next few months, so I've been hard at work on a Dungeons & Dragons setting called the Island of Yane. I plan to roll it out here over the next few weeks for your reading pleasure. This should go without saying, but if you plan to play in my campaign, please don't read any of the content here. Oh, but I'm excited! Up next: a rather ugly map.